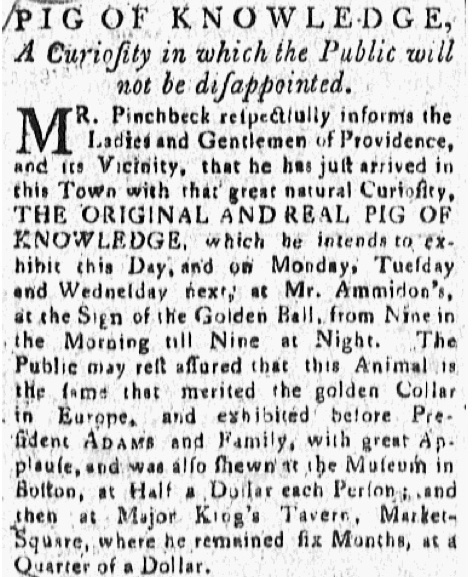 Mr Pinchbeck, whose advice on how to train a Learned Pig was featured in one of the more popular posts on these pages, enjoyed enormous success with his own sapient animal in the northeastern states of America in the late 1790's. 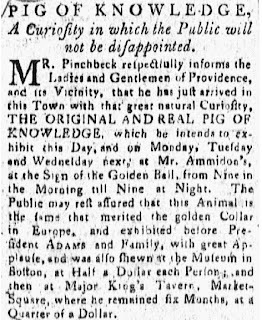 And, among the numerous cities and towns on his itinerary, I was delighted to discover that my longtime home of Providence, Rhode Island, was indeed visited; man and pig appeared there late in 1798 at a venue described as "the Sign of the Golden Ball," whose proprietor was one "Mr. Ammidon." On researching this fine establishment, I was amazed to discover that it was located at 159 Benefit Street, adjacent to the present site of the George Earle Building at whose longtime tenant, Geoff's Superlative Sandwiches, I had just eaten a sandwich yesterday! Thank heavens it was pork-free. A bit more research revealed that the "159" address was originally assigned to a neighboring lot, site of the original inn known as the "Golden Ball" and later as the Roger Williams Hotel and lastly the "Mansion House," which had hosted many luminaries, George Washington, James Russell Lowell, and Edgar Allan Poe among them. Alas, it was demolished in 1941, not long after these photos were taken for the Historic American Buildings Survey. The storefronts adjacent to Geoff's are currently vacant -- I am tempted to rent one and open a "Learned Pig" emporium of some kind -- but for now, I am content simply to know that, by some strange and random miracle, my footsteps and those of Pinchbeck's Pig of Knowledge trod the same streets. If only the celebrated Francisco Goya had known of this remarkable learned pig's tale, he may have drawn another capprichio. Many thanks for your comment, and the link to this delightful etching. I've found a larger version here via the Wikimedia Commons. The caption, "What if the pupil knows more?" has an apt quality as well! Wow--I loved looking at the Providence buildings from the 40s--you are quite the sleuth.